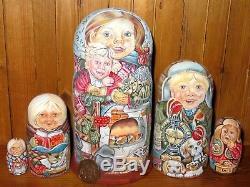 Russian, hand carved and painted beautiful wooden MATTset of 5 nesting dolls. The first one signed by the Russian Artist. Height of the biggest doll is 18 cm or 7 1/16 inches. These items are creations of a very skilled and passionate artist who has developed her own style which is both unique and traditional. Her work has not just a wonderful fine quality finish but also has a beautiful loving warmth to it. If you are looking for a very special set for a special present or for your own collection, this is it. I also have a selection of her amazing works in my shop as more Russian Dolls so please take a look and see if there is something else you like. All my dolls fit inside one another!!! Please leave feedback once you have received the item so that I know it has arrived safely. I will leave feedback in return. Powered by SixBit's eCommerce Solution. The item "Matryoshka Children Chicken Cat Puppy Dog Russian MATT nesting dolls 5 Obichova" is in sale since Wednesday, November 21, 2018. This item is in the category "Dolls & Bears\Dolls, Clothing & Accessories\Russian Dolls". The seller is "tom3burma" and is located in norwich, Norfolk. This item can be shipped worldwide.